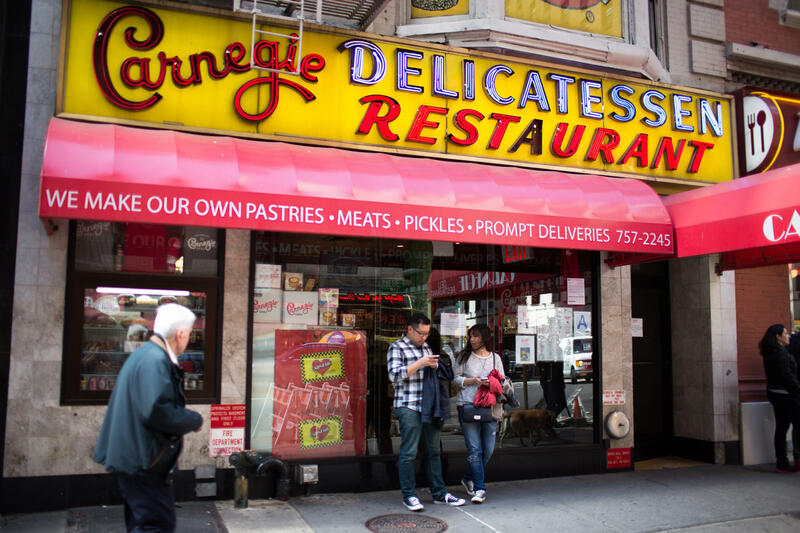 NEW YORK -- After 79 years of serving up heaps of cured meat to tourists, theater patrons and workaday New Yorkers, the Carnegie Delicatessen will slice its last ridiculously oversized sandwich on Friday. Fans lined up all week for a last bite at the restaurant, which got a star turn in Woody Allen’s 1984 film “Broadway Danny Rose” and remained a stop until the end for out-of-towners looking for the classic New York deli experience. Marian Harper-Levine, President of the Carnegie Deli and a second-generation owner, called the decision to close its 7th Avenue location “incredibly difficult,” CBS New York reports. Craig DeGregorio, 38, of Long Island, said he waited for nearly 90 minutes to chow down on its signature dish, a mountainous, $20 pastrami sandwich. The lines in the cold Friday started at 4:45 a.m. Nick from the Bronx said he waited in line for two hours. The line was composed of people from all over. “I’m way down in the swamps of South Florida, heard of it, but didn’t know what it was, now I do, so I’m ready to go in,” Steve Osceola told CBS New York. “It is delicious, we will miss it so much,” one woman said. “It’s worth the wait. My feet are still cold, but this is hot, this is hot,” another woman said. The Carnegie, its walls now lined with photos of celebrities who have eaten there, opened in 1937, drawing its name from Carnegie Hall just a block up 7th Avenue. Aside from the long lines out on the sidewalk (and unusually high prices), the place screams old New York, from its vintage neon sign, to the items on the menu: slices of cheesecake, knishes, tongue and chopped liver, and a $30 reuben. Another patron dining in the final days, Donna Nevens, of Elizabeth, New Jersey, said she wanted to be able to tell her friends she ate at the “world famous Carnegie deli” at least once. “It’s a New York institution,” she said, anticipating she’d order a “Woody Allen,” an overstuffed sandwich of half pastrami and half corned beef. Although the Carnegie has remained popular with tourists, New Yorkers these days are more likely to go looking for authenticity elsewhere at lower prices. And it’s been a rough few years for the Carnegie. The restaurant reopened last February after being closed for nearly a year amid an investigation into a possible illegal natural gas hookup, discovered after a utility crew found a diverted line while they were investigating a leak. The personal lives of owner Marian Harper and her husband Sandy were thrust into the public spotlight with a messy divorce after she accused him of having an affair with a hostess and slipping her cash and pastrami recipes. The deli was also ordered to pay $2.6 million in back wages to its employees after a labor dispute. Harper has insisted the closure has nothing to do with any of those issues. She’s said her long hours at the deli have taken a toll and she wants to take time to enjoy her life. A spokeswoman for the deli said in September that Harper would focus on licensing the brand and selling products for wholesale distribution. The restaurant is scheduled to close at midnight after a last full day of business Friday. It will still have outposts in Las Vegas, Bethlehem, Pennsylvania, Madison Square Garden and at the U.S. Open tennis tournament in Queens.